I've been trying to get rtorrent stats in conky for ages and today I finally found a solution. 1. You'll need rtorrent with xmlrpc-c support. The easiest way to get this is to install rtorrent-svn from AUR. 3. Download the script xmlrpc2scgi.py from this site: http://libtorrent.rakshasa.no/wiki/UtilsXmlrpc2scgi. I used the version added by glenn on 05/23/08 06:02:00. It's easy to customize the output. You only need to edit the something.sh to your liking. Check out http://libtorrent.rakshasa.no/wiki/RTorrentCommands and http://libtorrent.rakshasa.no/wiki/RTorrentCommandsRaw for more information. I can upload my script if requested. All credits for this goes to BadOmen at the ubuntu-se.org forum. I just wanted to share this with my fellow archers, so I've customized the install process to Arch Linux. Also the original thread is in swedish, so it ain't easy to understand for anyone outside off Scandinavia. I suppose I should put this in another thread (I hope you don't mind), but since this is here, I'll share a little python script I made for getting the status of torrents from Deluge. This one is made for use with dzen but can be modified for conky by changing the output and removing the loop. info['name'] = info['name'][0:8] + ".."
info['name'] = info['name'][0:18] + ".."
It works great. Thanks a lot for your big efforts. How would I just display "Active" torrents and not all torrents in conky? part of the script so you can limit the amount of torrents that are getting displayed. i was wondering if you could help me. i have got wtorrent front end running, which requires scgi_port to be set, and when i set this i cannot use scgi_local. 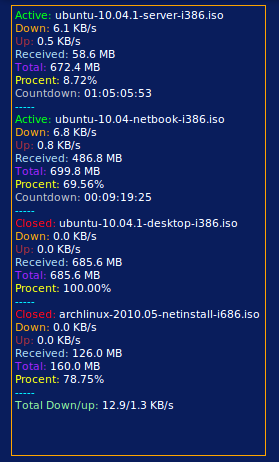 is there a way i can have both the wtorrent webui and be able to have my stats in conky. any hint on how to fix this problem? You can use pkgfile to search the repos for the owning package. You need to install xmlstarlet from aur. will print the name of the torrent in red and show the 15 first characters. Else you will not get the text coloring. And just a note, the time interval for execi/execpi can't be less then update_interval in configuration. And if the time interval is set to 3 seconds then the time left will not be more exact than that, but it is possible to comment away the seconds and just show hour and minutes. I have not tested the code with conky > 1.6 so i don't know how it works now and I am using Ubuntu, not Arche. This script collects information from the torrents in rTorrent and prints it out. If you do not want the conky code then just use the def iterTorrents to get a dictionary of information from every torrent. xmlrpc2scgi.py to be in the same directory as this script. Set the text_buffer_size so it's not cutting the output. #      (at your option) any later version. #      GNU General Public License for more details. # This script collects information from the torrents in rTorrent and prints it out. # If you do not want the conky code then just use the def iterTorrents to get a dictionary of information from every torrent. # it is possible to configure it under def  __init__() and change def __main__ if needed. # rtorrent with xmlrpc-c working. # xmlrpc2scgi.py to be in the same directory as this script. # Set the text_buffer_size so it's not cutting the output. # Just one of them can be true at the same time. if all is False then Just Total Down/Up will be shown. # Replacing a color with an empty string '' will show your default Conky color.
""" A iterator that returns a dictionary with information from every torrent in rTorrent. """ """Collects information from the torrent. This must be called for every torrent"""
""" Is colled from showTorrentInfo to display the correct torrents specified in __init__. """ """ Shows the torrent that you have specified in __init__. """ """ Calls __ShowTimeLeft() just when needed. """ """ Shows the total upload and download speed """
""" Shows the line and makes shore that the liens just show up for the visible torrents.""" Edit: Updated the script: Added more config options. Is it possible to know how much data my rtorrent client has uploaded (seeded or served ) ??? I am new to the world of python..Please guide me . Of course, that's only what's still loaded in the client, i.e. excluding the upload for any items you deleted. I hope to come around to record some statistics in RRD archives soon, then that's solved, too.